Description. Show Horse Alliance horses are first and foremost Saddle Seat Show Horses with emphasis placed on conformation, action and attributes most easily recognized and associated with high trotting animated horses possessing upright carriage, brilliance, quality and show ring presence, and finish. Junior Horse classes are for horses ages Five Years old and Under. Undesirable - Winging, interfering, traveling too wide behind, mixing of gaits, having a shackled or excessively shod appearance, and loss of form in carriage while performing any gait. Walk - Judging at the walk is based on execution, quality and action according to division and class type. The walk is required as a transition between gaits, except between the slow gait and rack. 1. Walk - The walk should be a willing, true and straight four beat gait. An occasional two beat jig should not count against an otherwise exceptional individual as long as it does not appear to be from a lack of willingness. 2. Animated Walk: The Animated Walk is a highly collected gait exhibiting much primp at a slow regulated speed with good elastic action and animation. It can be either a two beat or a four-beat gait performed with easy control, great style, elegance and airiness of motion. Trot - The trot is a natural two beat diagonal gait in which the front foot and the opposite hind foot take off from the ground in unison and land simultaneously. The trot is always performed with balance. A balanced trot consists of shoulder use, straight and true flexion of rising front legs, driven by flexing hocks propelling the horse forward in a cadenced manner. The degree of elevation, collection, hock use and animation is determined according to each division and the type of class. 1. Park Trot - The Park Trot desirable in Three-Gaited and Fine Harness classes is characterized by elegant elevation and brilliance, and executed in a highly collected, very animated, precise and cadenced manner. The horse's energy should be directed toward elevation, animation, carriage and suspension, rather than speed. The ideal Fine Harness horse should exhibit maximum height, flexion and extension of front legs, whereas the ideal Three-Gaited horse should exhibit maximum height, lofty elasticity and front leg flexion. Both are driven by deeply flexing hocks propelling the mass of the horse aloft, as well as forward, in a completely cadenced manner. Speed to be penalized. 1a. 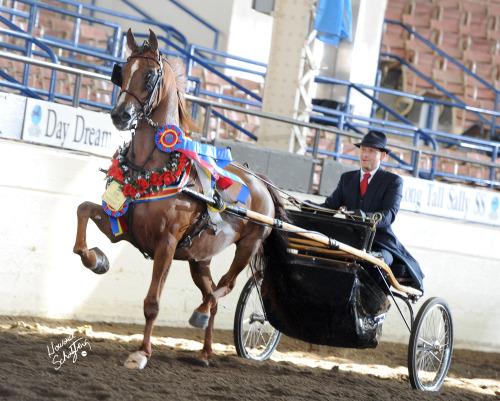 Show Your Horse - At this command the driver has the privilege of showing the Fine Harness horse to its best advantage and best form at the trot, but speed will be penalized. 2. Gaited Trot - The ideal trot of the Five-Gaited horse features elevation combined with flexion and extension of front legs, propelled by hocks which drive the horse forward allowing it to show speed and a lengthening stride while remaining in form. The desired speed is the maximum rate at which the horse can trot while still maintaining proper form, control, balance and cadence. 3. Pleasure Trot - In pleasure classes, there is more emphasis on the way of going as a pleasure gait and performed with only moderate speed. Where manners are paramount, more emphasis should be placed on the ease by which the trot is performed. 4. Gaited Pleasure Horse Trot - Ground covering and balanced, performed with ease and moderate collection. Moderate speed while easily maintaining control and form is desirable. 5. English Pleasure /Pleasure Driving Horse Trot - Bold, energetic and balanced, performed with ease and moderate collection. Rising and elevated front leg use, driven by flexing hocks combining to characterize the horse as being easy and a true pleasure to ride. 6. Strong Trot - A Strong Trot may be requested in Pleasure Driving classes. According to each horse's ability, the strong trot should be conveyed by a lengthening of stride and increase in energy while retaining form and manners. Excessive speed is to be penalized. Canter - The canter is a relatively slow, lofty and fluid gait with a definite three-beat cadence in which two diagonal legs are paired, the single beat falls between the successive beats of the two other un-paired legs. The un-paired legs act independently - the foreleg with which the horse leads and its diagonal hind. Propulsion comes from the hind quarters with the leading foreleg sustaining the concussion of the final third beat and a brief interval when all four feet are off the ground. The canter is an ambidextrous gait, executed on the lead which is toward the center of the ring to relieve stress and aid in balance. A lead is determined by which foreleg (right or left) sustains the concussion on the final third beat, after its diagonal hind leg started the propulsion of the first beat. It is acceptable, though not encouraged, for the horse to have a bolder, strong canter in those classes where manners are not paramount or where speed at a qualifying gait is desired. Ease of control, rate of speed and degree of collection may vary according to the class specifications. 1. Three-Gaited Canter - The desired canter is slow and animated with high flexing action and considerable propulsion. It is performed in a highly collected, brilliant and cadenced manner while maintaining form and carriage. 2. Park Horse Canter - High flexing action with propulsion and animation, boldly performed with moderate collection while still maintaining form. 3. Gaited Horse Canter - A ground covering stride with high flexing action showing both propulsion and extension. Executed in a moderately collected manner and with slightly greater speed while maintaining reasonable form. 3a. Gaited Pleasure Horse Canter - Ground covering with high flexing action and propulsion, executed with ease, moderate speed and collection while maintaining ease of control and form. 4. Pleasure Horse Canter - The desired canter is bold, yet unhurried and performed relatively straight with moderate collection and propulsion The horse should appear bright but present a relaxed appearance indicating that it is a true pleasure to ride. Where manners are paramount, a relatively slow, consistent rate of speed should be maintained with little obvious effort from the rider. Slow Gait - The slow gait was developed from the pace to be a four-beat gait with each of the four feet contacting the ground separately. In the take off, the lateral front and hind feet start almost together, but the hind foot contacts the ground slightly before its lateral forefoot. The slow gait is a highly collected restrained four-beat gait with most of the propulsion coming from the hind quarters, while the forequarters assist in the pull of the final beats. Ideally, the Slow Gait is executed slowly with hesitation and elevation and with true and distinct precision. It is high, lofty, brilliant and restrained denoting the style, grace and polish of the horse. The slow gait is not a medium rack. Speed is to be penalized. Rack - The rack is a four-beat gait in which each foot meets the ground at equal, separate intervals. It is smooth and highly animated, performed with great action and speed, in a slightly unrestrained manner. Desired speed and collection are determined by each horse's ability to perform at the maximum rate while retaining form. Racking in form should include the horse remaining with a good head set. It should be performed by the horse in an effortless manner from the slow gait, at which point all strides become equally rapid and regular. To be penalized: Any tendency to become trotty, pacey or hitchy gaited. In pleasure classes, there is more emphasis on the way of going as a pleasure gait with only moderate speed required. Where manners are paramount, there is more emphasis on the ease by which it is performed by the rider. General - Five-gaited horses should possess brilliance, elegance and beauty with speed and energy directed toward animation while maintaining correct form. Entries to be shown with a full mane and tail. Appointments and Attire - A double-bridle, consisting of curb and snaffle bits, and a flat, English-type saddle are required. Protective boots are allowed. Riding habits should be conservative and informal. Gaits - walk or animated walk, trot, slow-gait, rack and canter. Classes - Open, Limit, Novice and Maiden horses to be judged on Performance, Presence, Quality, Manners and Conformation. Junior Horse Classes - Horses Five Years Old and Under, including classes for Four Year Olds and/or Three Year Olds to be judged on Performance, Presence, Quality, Manners and Conformation. Ladies, Gentlemen, Junior Exhibitor and Amateur classes to be judged on Manners, Quality, Presence, Performance and Conformation. Championship Eligibility - Horses must have been entered, shown and judged in a qualifying class with similar judging specifications. Stripping is optional in Championship classes and two assisting attendants are permitted. General - The Five-Gaited Pleasure horse should possess beauty, quality, style, manners and conformation which displays its suitability to perform prompt, comfortable gaits, giving the distinct impression that this horse is a pleasure to ride. Gaits - walk, trot, slow-gait, rack and canter. Transitions should be smooth and effortless and the horse must present a picture of being a true pleasure to ride. Classes - Open, Limit, Novice and Maiden, Junior Horse Classes, (horses Five Years Old and Under, including classes for Four Year Olds and/or Three Year Olds). Ladies, Gentlemen, Junior Exhibitor and Amateur classes. All classes to be judged on Manners, Performance, Presence, Quality and Conformation. Championship Eligibility - Horses must have been entered, shown and judged in a qualifying class. General - Three-Gaited horses should be the epitome of beauty, brilliance, upright elegance, expression and high motion, and shown in a highly collected manner. Motion gained through speed is undesirable. Gaits are collected, demonstrating high action and carriage, with energy directed towards a display of sharp animation style and precision. Horses may be shown with a full, braided or shaved mane and tail. Appointments and Attire - A double-bridle, consisting of curb and snaffle bits, and a flat, English-type saddle are required. Conservative, informal dress is required during morning and afternoon classes. Formal Attire is appropriate but not mandatory for evening. Gaits - animated walk, park trot and canter. Classes - Open, Limit, Novice, Maiden horses judged on Performance, Presence, Quality, Manners and Conformation. Junior Horse Classes - Horses Five Years Old and Under, including classes for Four Year Olds and Three Year Olds to be judged on Performance, Presence, Quality, Manners and Conformation. Ladies, Gentlemen, Junior Exhibitor and Amateur classes to be judged on Manners, Performance, Presence, Quality and Conformation. General - The Park Horse is an animated, brilliant performer with high motion, but not shown as highly collected, or with the same degree of animation required of the Three-Gaited horse. Horses must be shown with a full mane and tail. Appointments and Attire - A double-bridle, consisting of curb and snaffle bits, and a flat English-type saddle are required. Conservative, informal dress is required during morning and afternoon classes. Formal Attire is appropriate but not mandatory for evening. Gaits - animated or walk, park trot and canter. Junior Horse Classes - Horses Five Years Old and Under, including classes for Four Year Olds and Three Year Olds) to be judged on Performance, Presence, Quality, Manners and Conformation. Ladies, Gentlemen, Junior Exhibitor and Amateur classes to be judged on Manners, Performance, Presence, Quality and Conformation. General - The English Pleasure horse generally has less motion and animation than Three-Gaited and Park horses, but should be alert and exhibit high, free moving action. Horses must be shown with full mane and tail. Appointments and Attire - A double-bridle, consisting of curb and snaffle bits, and a flat English-type saddle are required. Conservative, informal dress is appropriate. Gaits - walk, trot and canter. Classes - Open, Limit, Novice, Maiden horses judged on Performance, Manners, Presence, Quality and Conformation. Junior Horse Classes - Horses Five Years Old and Under, including classes for Four Year Olds and Three Year Olds to be judged on Performance, Manners, Presence, Quality and Conformation. Ladies, Gentlemen, Junior Exhibitor and Amateur classes to be judged on Manners, Performance, Presence, Quality and Conformation. Championship Eligibility - Horses must have been entered, shown and judged in a qualifying class with similar judging specifications. Open to two-year old SHA horses. Bridle shall be light, show type; full bridle or single snaffle bridle. Running martingales with one or two reins are permitted. Tiedowns, draw reins, and German martingales are prohibited. Horses are to be shown both ways of the ring at the walk and trot. Flat footed or animated walk are acceptable. To be judged on Performance, Presence, Quality, Manners and Conformation. General - The Fine Harness Horse should be the epitome of beauty, brilliance, elegance, expression and high motion, whose energy should be displayed through animation rather than speed. Appointments and Attire - Shown in an appropriate fine harness and four-wheeled show buggy. Bridle with blinkers, <?xml:namespace prefix = st1 ns = "urn:schemas-microsoft-com:office:smarttags" />Liverpool or snaffle bit with separate over check or side-check is required. Protective boots are permitted. Headers are permitted in line-up. Gaits - animated walk and park trot. Judges may also call "Show Your Horse" in Open, Junior Horse, Limit, Novice and Maiden classes. Classes - Open, Limit, Novice, Maiden and Junior Horse classes (including classes for Two Year Olds, Three Year Olds and Four Year Olds) to be judged on Performance, Presence, Quality, Manners and Conformation. Ladies, Gentlemen, Junior Exhibitor and Amateur classes to be judged on Manners, Performance, Presence, Quality and Conformation. General - The Pleasure Driving horse generally has less motion and animation than the Fine Harness horse, but should be alert and exhibit high, free moving action. Horses must be shown with full mane and tail. Appointments and Attire - Shown in an appropriate fine harness and two-wheeled show buggy. Bridle with blinkers, Liverpool or snaffle bit with separate over check or side-check is required. Headers are permitted in line-up. Gaits - walk, trot and strong trot. Classes - Open, Limit, Novice, Two-year old and Maiden horses to be judged on Performance, Manners, Presence, Quality and Conformation. In Hand classes are to be scored in comparison to the Standard which represents the ideal Saddle Seat type show horse. In addition to suitable and functional conformation, motion, style and quality should be well represented and considered. Handlers are encouraged to present their horses in a manner which best displays the natural strengths, attitude and finest features of each horse. Horses to be presented as Show Horses, wearing an appropriate show type halter or bridle, and may be shown in a bit, if age 2 or over. One appropriately dressed handler and assistant are allowed per horse during presentation. Each handler or assistant may present more than one horse during the class and carry a whip with or without a small plastic or small paper bag attached. Their use should not interfere with other class entries. Handlers and assistants are also allowed the use of small shaker cans or tins and should be courteous to all other exhibitors in their use. In case of a tie in total points, final placement would be decided by the call judge. Judge's points for each scoring category may be announced when horses are receiving their awards. 1. Horses enter the ring individually to be judged. Enter at a trot. Trot length of rail and return. Stop to be judged. Walk to rail. Next horse repeats. All remain in the ring (at far end). 2. All entries trot into the ring and line up on rail. Horse walks to judge(s) for evaluation. Return to rail, trot length of rail and return. Trot back to line up and remain on rail. Emphasis shall be placed in the following order of importance: Hind leg motion, Front leg motion, Conformation, Show Horse Attitude, Beauty and Quality.